A new winner has been found for this year’s edition of the Ballon d’Or. All the big names where there and once again a Nike athlete won the nomination. Nike has therefore, as per usual, made a Ballon d’Or boots, which pays tribute to the winners. In the last couple of years we’ve the Ballon d’Or winners, such as Ronaldo and Messi, play in their own Ballon d’Or boot, after they’ve taken home the iconic Ballon d’Or trophy. So, it’s only in its place for Nike to make some new boots for the winner, which this year also plays in the popular Mercurial boots, as Ronaldo did last year. But this year is just a bit more special, as the Mercurial boot has won not only the Ballon d’Or prize, but also the U21 Ballon d’Or, The KOPA trophy. Mbappé, the Boy Wonder, took home the U21 Ballon d’Or, the KOPA trophy, which is something you might have expected after seeing this year’s shortlist of nominees. Mbappé has achieved a lot of things, even though he’s only 20 years old. Last year he won the Golden Boy nomination, while he this year have won the World Cup together with France. Furthermore, he has also won the French Championship and numerous of other trophies with PSG, so there is no wonder why he took the KOPA trophy this year. Maybe an upcoming Ballon d’Or winner in the future? He looks like an heir to the throne, which Ronaldo and Messi have been sitting heavy on the last couple of years. The man of the night, well no one was really in doubt of this, is Luka Modrić. His performance throughout 2018 has been outstanding as he has been the engine on both the Real Madrid and Croatia team. He was one of the main reasons for Real Madrid winning the 3rd Champions League in a row, assisting Bale, Benzema and Ronaldo, while he captained the Croatian national team to the World Cup final, and just ended short to France. Modrić also won The Best nomination earlier this year and has been on everyone’s lips so far this season. Mad respect from Unisport to Modrić for finally getting beating Ronaldo and Messi in their two-horse race the last couple of years. The Limited Edition Mercurial Ballon d'Or comes in a beautiful silver colourway, and is truely made as a collector's item. 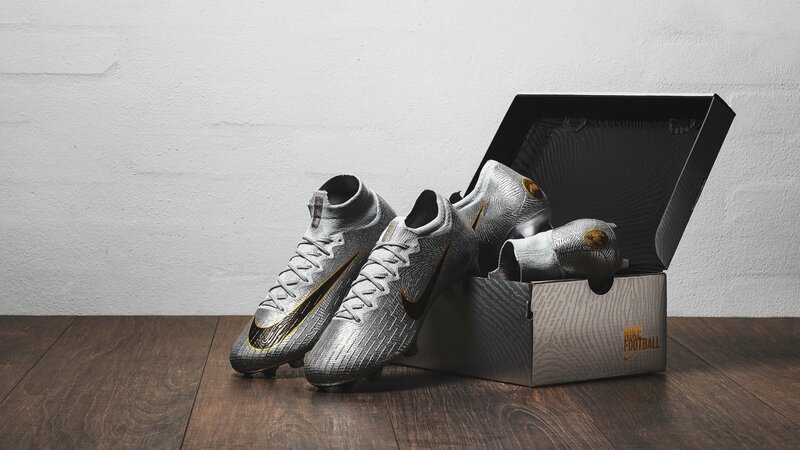 Furthermore, the Mercurial boots also feature a shimmering design, while a golden touch is added to the boots. Nike has added a golden fingerprint on the inlays, Nike Swoosh and the heel, as the Mercurial has been a dominant force in the Ballon d'Or nomination, and the Ballon d'Or is in the Mercurial DNA. No matter if you’ve rooted for this years’ winner or another one, then you can the Ballon d’Or boots at Unisport from the 4th of december at 09.00 CET. We recommend you to be ready and quick as they are highly popular, so there is no time to waste tomorrow! Find the Ballon d’Or boots right here!